One of the best ways to cook venison is low and slow in a dutch oven or a Crock-Pot. I prefer to make my own sauces and marinades, but with life rather hectic right now I discovered that there are actually some really tasty options right in the store. Campbell’s has a slow cooker line that celebrates ethnic cuisine, like their Sweet Korean BBQ Slow Cooker Sauce with roasted garlic and sesame that I used in this recipe. Slow cooker or simmer sauces are also great if you work long days or if you want to try some new flavors at home. Not sure if you like Korean food? Korean BBQ is fruity sweet with nutty undertones. It can also have a little heat to it too. 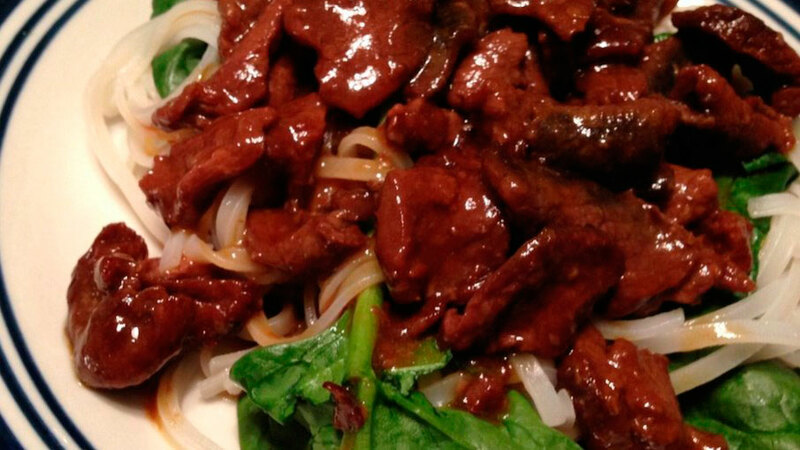 Take some venison out of your freezer and try it! With everything in the packet it saves you from buying a bunch of specialty ingredients. Watch the video and if you want to give this delish dish a try, get the recipe below. 1. Rinse and pat dry venison, cut into stir-fry size bites and add to Crock-Pot. Pour slow cooker sauce on top of meat and stir to distribute. Place lid on Crock-Pot and set on lowest setting. Cook for 5-7 hours. 2. Prepare rice noodles per instructions and plate with spinach. Scoop portions of meat and sauce on top of noodles and serve. For more Field to Fork recipes, visit JulieGolob.com.